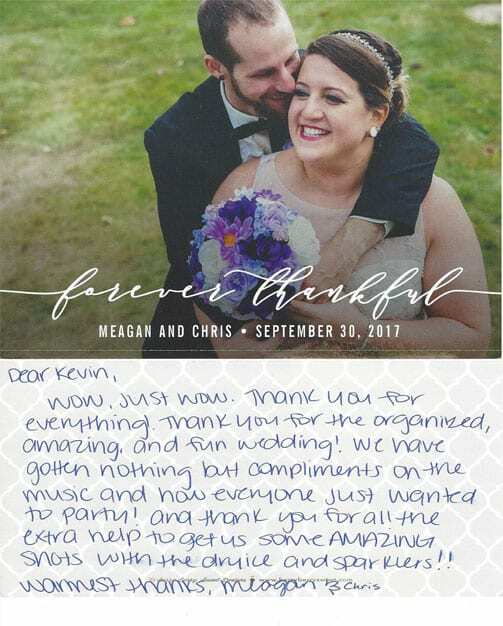 Meagan and Chris send a personalized thank you! It is always exciting to open up mail from a customer from one of our most memorable weddings! Meagan and Chris sent an amazing thank you card for their september wedding. Thanks again for having Rockin’ Ramaley be part of your day! Wow, just wow. Thank you for everything! Thank you for the organized, amazing, and fun Wedding! We have gotten nothing but compliments on the music and how everyone just wanted to party! And thank you for all the extra help to get us some amazing shots with the dry ice and sparklers! !